Do you remember Fat Princess, the game where you played capture-the-flag with the other team’s princess, all the while sabotaging their chance for victory by fattening up said princess with mounds of cake? Well, developer Fun Bits is back with a new game which is similar only by virtue of the capture-the-flag mechanic; Squids from Space. 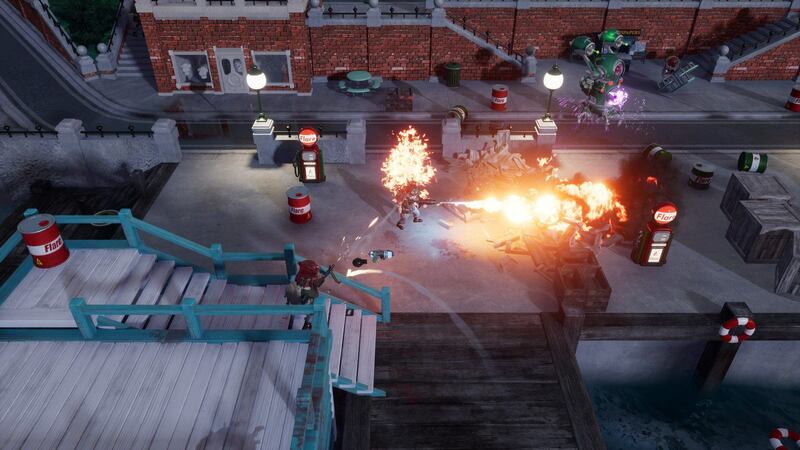 Squids from Space is a team-based tactical PvP top-down shooter where 1950s Earth is under attack from a race of sinister aliens that may or may not be hyper-intelligent squids known as…Squids. The people of Earth must unite and fight back by pitting their pitiful human weapons against the bizarre technology crafted by the Squids. The future of the planet must be ensured! You begin the game by selecting your team – human or Squid (or you can be randomly assigned or just spectate, if you want). Once you’ve joined a game, you work alongside your team to beat up the opposition using whatever weapons are available. 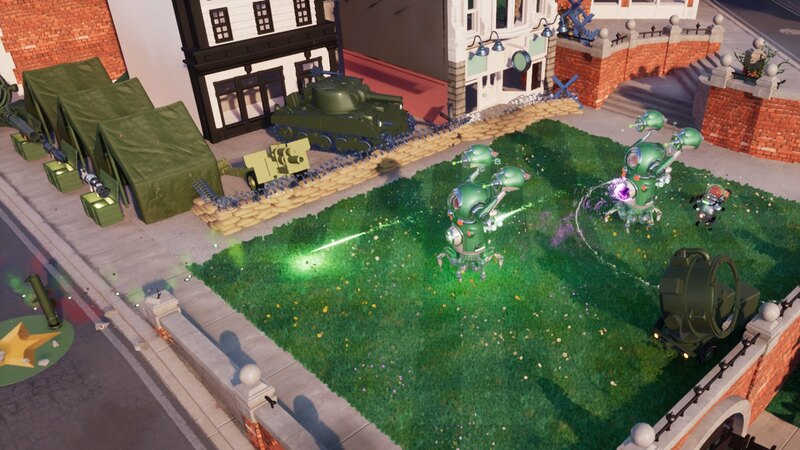 As a human, you blast your enemies with shotguns, rocket launchers, grenades or bundles of dynamite, whereas team Squid is equipped with disintegrating rays, massive Crawler Tanks and freeze rays, to name a few. You can also pilfer the opposite side’s weapons and use them, although I played as a Squid most of the time and couldn’t really go past blinding rays and freeze rays over simple guns. 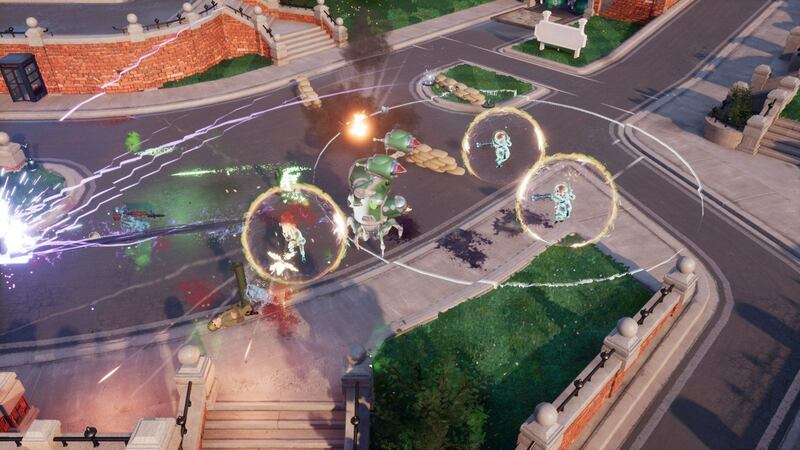 Another part of gameplay is collecting resources scattered around the battlefield (e.g. 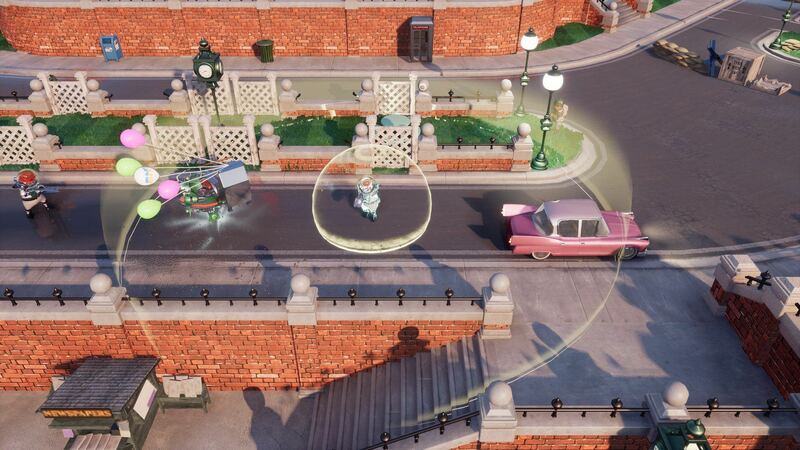 stealing manhole covers and shop windows) and returning them to your base to contribute varying values to the overall team score. When the team levels up, new weapons become available at your base, like enhanced freeze rays. You can also blow up cars, gas stations, oil barrels, and plenty of other things as you wage war across the map. I couldn’t tell what that actually accomplished, but I did it anyway because it was fun! Battles last for about 10-15 minutes, which means you can play as much or as little as you want. I played about three games and after that point I’d had enough, but after a few hours I wanted to go back and play more. I think if I had actual friends to bully in the game or wasn’t just fighting against bots, it would be a lot more fun and I would definitely want to play for longer. That said, it’s not all shooting and stealing in Squids from Space! Your main objective is capturing the enemy leader and carting them back to your base. If you get struck by an enemy while carrying the leader to your base, you’ll drop them and they’ll start to make their way back in due course. Both sides get an alert on their screen when a leader has been captured and when they have been dropped, so you can bet everyone will rush over to take care of business once someone gets their grubby hands (tentacles?) on the prize. Fun Bits have currently released Squids from Space in early access for a select few and are still working out some of the bugs, but if I’m completely honest, I didn’t really find any. Everything worked exactly as I had expected. The gameplay is tight and responsive when using a controller or keyboard and mouse and overall it’s just really fun to play. The environment is colorful and the general tone of the game is very light-hearted and tongue-in-cheek. I highly recommend grabbing the game when it becomes fully available and forcing your friends to grab it, too.